There are so many amazing versions of these steamed sausages floating around, but one more couldn’t hurt! These are an excellent brunch sausage, perfect for slicing up alongside French Toast. They have a slightly sweet mapley taste, and when they sop up a little extra maple syrup, well that’s quite allright. I used both chickpea flour and nutritional yeast because I love that texture best, but you can use all nutritional yeast, or all chickpea flour. This recipe is anything but fussy. Here’s a PPK thread that has about a bazillion and one ideas for variations on the steamed sausage. This recipe makes me so happy. How I’ve yearned for a vegan sausage with all sorts of flavors beyond wheat gluten. Hooray! One can never have too many steamed sausage recipes! I have now added these to my list of Weekend Foods to Make. It is with snausages like these that I hope to wean my husband off of pork. I can’t find liquid smoke – can I use hickory smoke seasoning (dry)? 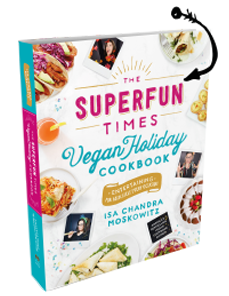 I love your sausage recipes in Vegan Brunch and this sounds possibly more amazing. I can’t wait to try it! One of the things I most hate about being gluten intolerant is no more seitan sausages. I love them so much! Sounds delicious. I’ve been sort of fiending to make sausages lately – I have fennel seeds on the brain. Sounds lush but what is liquid smoke? this is phenomenal! i can’t wait to taste them! sounds yummy! just wondering how i can replace the steamer since i don’t own one? Make three or four small aluminum balls, place on bottom of 5- or 6-quart pot, fill with an inch or so of water, put your wrapped packets on a plate that fits inside your pot, and close the lid. Or use a metal colander that is big enough to suspend itself on the rim of the pot or that has legs or a rim long enough to keep it out of direct contact with the water. Anything that will suspend the packets above the water and surrounded by the steam. And when you get a chance… invest in a simple metal steamer basket. They’re cheap, and you’re becoming a serious cook and you need one. They’re sold everywhere, even Walmart, and they’re cheap. Came out great. Did not have chickpea flour but will get some and try again as these came together very easy! I think I want to try browning them a little in a cast iron or on the grill. Thanks! This recipe is indeed awesome. But the sausages weren’t nicely shaped. Could it be that I used heavy duty foil? Most major US grocery stores carry this, next to the BBQ stuff. In a pinch, I have used either smoked salt and / or smoked paprika when out of the liquid smoke. Every since I discovered your recipes with the release of Appetite for Reduction, I have referred to you as my “kitchen hero.” After successfully making these sausages, you are now upgraded to “kitchen goddess.” Thank you for sharing your vegan wisdom, Isa. Mmmmmm! They turned out amazing! I made these last week and just wanted to add that the flavor is just so sweet/smoky perfect and they’re so freaking easy to make. I understand that spice profiles can be changed, but then the maple syrup might not go so well. As its liquid it seems if I take it out it will affect the end result/texture. Any suggestions on a more neutral flavor liquid if I use other spices? Kelly see the post I linked to with all of the variations! Liquid smoke has been around almost forever. It will be in the spice aisle. It’s not a very big bottle and is inexpensive. I’ve used it for years to give meats a smokehouse flavor. Worth buying. I use Wrights liquid smoke. They make two flavors(Hickory and Mesquite). I can only find Mesquite online(Amazon…).They are distinctly different. Not sure why recipes don’t specify a particular flavor Wrights or otherwise. I made these this morning and they were brilliant. I concur that one can never have too many variations of this recipe! Just fried one for brunch – delicious. LD, I got a perfect cylindrical shape by really tightening the foil ends – you can see the dough filling up inside the wrapper. I have the ultimate “dumb question”. 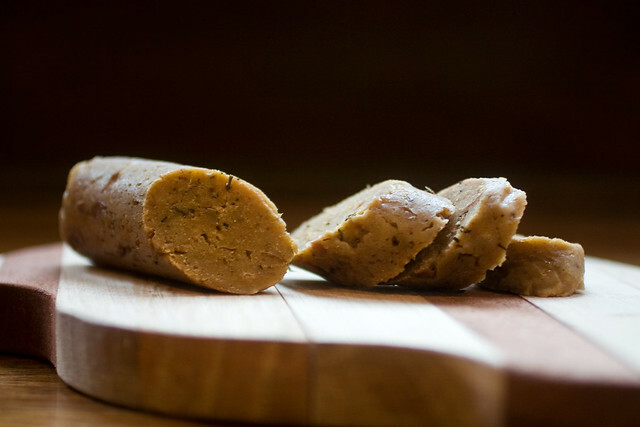 When the recipe calls for Vital Wheat Gluten, would I be adding Seitan or a dried ingredient? It’s a flour, most health food stores have it, even some regular groceries do. Google it! You can buy it directly from Bob’s Red Mill online or by phone from same. It’s made from wheat flour, which is kneaded with water to develop the gluten, then rinsed under running water while working the mass, until everything but the gluten is washed away and the vital wheat gluten is left behind. So buying vital wheat gluten skips all that mess and saves time, and gives you an exact amount to work with. Easy peasy. Vital wheat gluten is made from wheat flour. The wheat flour contains glutenin and gliadin. When you add water and knead the flour, it loosens up their chains and they combine, forming your stretchy gluten. Just made a version of these and they were fantastic. I love this website, I won’t be eating any more store bought veggie burgers or sausages ever again! I’m wondering about the beans. They haven’t got pinto beans in stores anywhere near me. What other kinds of beans could I use? Navy or great Northern are both great choices! I have trouble believing you can’t find dry or canned pinto beans at a grocery store. They’re one of the most popular beans. They would be at Walmart, Target, Whole Foods, Sprouts, or any other grocery chain or health food grocery. If not, Bobs Red Mill will send them to you, as well as the vital wheat gluten and lots of other ingredients. Awesome! My meat eating family is totally converted on the breakfast front now! Thanks again Isa! these were sooo good….i kinda messed up and put a whole can of cooked beans in lol but still very tasty…steamed them about 15 mins longer due tothe mishap with the beans..Thanks Isa!!! I have to add a comment because I’ve never until tonight made my own sausages! I’m always nervous about recipes that I can’t “check in” on while their cooking. Just trust that they’ll be done in 40 minutes. It worked and they are delicious! Can’t wait to crisp them up a bit and serve with pancakes. Thanks for your recipes – they’re a hit every time. I made these as a substitute for hot dogs. They were amazing! I know this probably defeats the purpose, but is there any way of making something like this without gluten? I’m both vegan, and fluten intolerant, and miss sausages in a bad way. Also, if you can’t find liquid smoke, you might also look for smoked paprika. That stuff is amazing. I have this same question. I would love to make a gluten-free version of this sausage, if anyone has some ideas for replacing the vital wheat gluten. Hi! I don’t have chickpea flour but reallllly want to make these today. Can I use an alternate flour? You can use regular old white flour. you can just double the nutritional yeast. Just saw this comment after posting about replacing the gluten flour. What are rice crumbs? I have been looking at this recipe and looking, but too afraid to try it…..but NO MORE!!!! I just made them and they are steaming even as I write!!! They smell so indescribably delicious….can’t wait to taste them!!! I’m very, very excited!!! Thank you so very much for this site (and all your books….your’s are my favs! And I’m not just saying that, I really mean it). Your recipes are the bomb!!! Oh yeah, and we’re having your French Toast in the a.m. It feels a bit like Christmas!!! I’ve been unconsciously moving toward veganism for a while now, and then I saw a film that changed my life. It’s Forks over Knives. Anyway, now I’ve made a conscious decision, but I am also omitting nuts and oils from my diet. Could this sausage vary greatly from excluding the olive oil? It seems that to go vegan you have to rely more on nuts, oils, and tofu… all of which I’d like to keep out of my body. Thanks for your input! You can certainly remove the oil from this recipe! This are very, very similar to Vegan Dad’s sausages! I love his recipe and everyone I share them with loves them too. What kind of steamer do you use? Any recommendations for one? I use the kind that fits right into my pasta pot. I think it’s supposed to be to drain pasta, too. Works like a dream. Hi Isa, first off just want to say thanks, PPK & your cookbooks are mindblowing! Also, would these be suitable for freezing after they’ve been steamed? Oh yes, they’re great frozen and reheated. Just made a batch of these, using left-over lentils instead of beans. made these last night with tofu scramble and home fries for breakfast for dinner. They were great, and I even cheated by mixing everything together in the food processor. Awesome!! I can’t find chickpea flour anywhere, so we doubled the nutritional yeast. I still haven’t procured a steamer yet either, but I used your suggestion (I read it somewhere..) to use my metal strainer, and it worked fine! I made 8 smaller sausages, and still had to cook the full time because the lid I used wasn’t super-tight fitting. (Lots of mismatched pans, pots & lids, you know..) There were great, and easy, and we will definitely be making them again! We’re excited about all the possibility & with summer coming up, for grilling too. This is yet ANOTHER thing you have converted to Homemade Only Status for me & my family! Thank you!! Indian cooks call it besan. If you have an Indian grocery, they’ll have it. And although I do have a steamer basket, when I need to pinch hit while making a large amount of tamales, I use my bigger spaghetti colander over my six quart pot, with a lid. is there something to replace wheat gluten and nutritional yeast? I made them as directed since it was the first time. Next time, I will probably tweak them slightly to keep my husband happy (no fennel, little bit extra liquid smoke, little less maple syrup) but that’s him. 🙂 I thought the recipe, as is, was awesome. Question: Would these work out in the steamer without being wrapped in tin foil?? Or would something horrible happen to them. I’m about to try it…. They will puff up like crazy and be spongy. We are a family of celiacs and gluten-intolerant folks. So many recipes, such as these wonderful-sounding sausages, rely on gluten or gluten-containing grains to make them work. I wish somebody would apply the McDougall way of eating to a strict gluten-free diet. I think you’d have a lot of takers! I am so excited to try this recipe! As far as steamers go, do you mean a vegetable steamer? I feel weird about putting foil in a veggie steamer…. Hey gluten free folks, I saw a veggie version of “polenta sausages” on a Dutch website – I’m translating the Dutch recipe here, which might be interesting. This is the exact translation – I am sure you can adjust the seasonings to suit your taste, but the concept seemed to work. Bring the vegetable stock to the boil with the olive oil and sprinkle in the polenta, stirring constantly. Let everything stirring constantly over low heat until thickened. It takes about 5 minutes. Finely crumble the silken tofu with the garlic, parsley and sage. Then mix well with the cooked polenta (let it cool slightly). Form the polenta-tofu mix into sausage shapes, wrap firmly with plastic wrap and refrigerate for four hours. Dust the “sausages” with cornstarch before cooking (heat oil in a pan and crisp it up). These are so easy to make. The dough smelled so good!!! I have them simmering right now. I can’t wait to try them. I love these! Adapted to be soy free using 2 Tbs balsamic an 1 tsp salt. Also use only chickpea flour. Wondering if there is a way to make these without aluminum foil? Anyone try something more reusable? » VeganMoFo: Uncle Buck’s Breakfast Club Don’t Eat Off The Sidewalk! So I just tried making these and while I like the flavor I found the texture to be odd. Very doughy. Did I do something wrong, like not cook it long enough, or is that how the texture is supposed to be? (once I put the colander in the pot the lid wouldn’t fit, so maybe I need longer than 40 minutes?) If sauteing, how long on each side over what heat? WIll they come out firm? I normally don’t steam things like this but bake them. It’ll usually come out a bit firm but after I cool it, it turns harder. These after cooling still feel very fragile. Are they suppose to firm up? Should I bake them or will they firm during grilling? I just can’t believe I’m eating right now a breakfast sandwich made with these saucisses! It is so freaking good… And I made it :). I can’t wait to try variations or created my own. Hummmm… Pesto, red pepper flakes and dry tomatoes No more store bought for me. Thanks Isa, you change my life! Gonna try this. Ever since Light Life discontinued their breakfast links my mornings have been so bereft of tasty protein. Thanks so much for sharing this recipe! I can’t wait to try it! Could you please tell me if there is a good alternative method to making the molds without the foil? I try to avoid using it as much as possible. People have use parchment that is tied at both ends. Not as neat, but still yummy! They came out amazing! Very, very tasty. I think the beans, which I mashed only roughly, added to the sausage-like texture, and I know sausage – I grew up in Poland, eating a lot of sausage, naturally. So of course I’ve just cooking a “Polish” version of the sausage, haha (the spice mix from thread mentioned above based on the Smoky Italian Sausage, i.e just the base, sans the Italian spices), Btw, to say a “Polish kiełbasa” is like to say “French cheese” – there are dozens of types – I might try to develop some additional spice mix recipes! They came out great (still hot)!! For personal preferences, next time I will probably decrease the amount of soy sauce (a bit too salty for me) and double the marjoram, and I might add a bit more beans for better nutritional value, hopefully the texture will not suffer too much. I can’t wait to eat them with caramelized onions. Thank you for this recipe!! I’d love to make isa Chandra & Terry’s various seitans but I can’t think of a substitute for aluminum foil. I don’t believe aluminum is safe to cook in. Anyone figure out a substitute? How many sauseges kan I steam at the same time? Can I lay them on top of eachother, if i double or triple the recipe or do I have to use two steamers? Made these last week! So much fun. They turned out a little on the sweet side for us, but I will totally make them again but add more spice! The texture was fantastic! I’ve new to a vegan diet…. about five months now and this site has been a life saver… THANK YOU! How you can make this recipe without a steamer? Hello, Well mine did not look like the picture (the picture matched my make of the Italian sausage), mine were a light chocolate brown. These Maple sausages are good, a bit too dense, so next time I am going to add just a bit more broth. The flavors are GREAT! Maybe a bit more fennel for my taste? These are definitely a “keeper”. Both this Maple and the Italian sausage are almost too easy to make, 20 minutes maximum to prep, then the 40 minute cook time, dinner in an hour. These are tastier, with the sense of fresh, over the commerially produced sausages. Plus I estimate the cost to be about $0.65 to $0.80 per sausage, much less cost. I would like to make something like this for my recently vegetarian husband but I don’t have nutritional yeast – I don’t even have a clue what it is 😛 Is there something that is in the realms of vegetarian (not necessarily vegan) that would substitute? Any help would be great, ta. Another PPK success in my kitchen. I will be making many variations of this one. Thanks! Is there any way these could be made into patties? I am not sure if I missed this in the hundred plus comments, but is there a substitute for the vital wheat gluten? Love your recipes, and I am so glad you are here to share them. Delicious recipe! I made a triple batch so I’d have plenty to freeze and use as we go. They were especially delicious sliced diagonally and pan fried. I served them as a side with the Blacked Tofu and Garlicy Grits recipe. Would love ideas on different seasonings to have for more savory options such as Italian or Southwestern Will have to play around with it! Thanks Isa! WOW! Thank you for sharing this recipe. I was craving (taste of) breakfast sausages and these hit the spot. (Not vegan) husband liked them too! I used leftovers as “pepperoni” on pizza with great results. We’re both farm raised, so a tough crowd to please as far as plant-based meats go. These are great! Thanks again! I am allergic to soy – is there something I could substitute for the soy sauce? The usual suggestions (vegan worcestershire, braggs liquid aminos) dont work since they’re all soy-based as well. I really want to try these out! therefore I simply use web for that purpose,and obtain the most up-to-date news. I’ve been building up to making my own seitan for a long time. It all came to a head this year. Trader Joe’s stopped selling their vegetarian “chik’n strips” due to needing to find another manufacturer. The other brands I’ve since tried, several with well recognized brand names, were disgustingly salty and greasy. Meanwhile, I want variety, have been a vegetarian for 46 yrs and once in a while I get tired of tofu. After reading lots of recipes, they all seem to have similar proportions and ingredients. Yours is quite perfect. I want them to taste like chicken, not the Japanese flavor profile. They were incredibly easy and reliable to make. They don’t have that shredded chicken breast texture that the vegan strips from Trader Joe’s had, but I can live with that. The chicken flavor profile I desired is there. They’re as easy to make as tortillas (for me, anyway). Thanks for the final push! I can’t wait to try! Do you think perhaps these can be made ahead and frozen? I would love to have them ready and just heat them up on a busy morning. The link for variations doesn’t work anymore. Is this page still available somewhere?